I spent a day woad dyeing on Thursday and had planned to use photos from that for today's post. Unfortunately my camera spent the day in its bag on the hall floor, which totally scuppers that idea. So here, once again, is some garden stuff. My poor roses are taking a battering from the days of torrential rain, but still look pretty when it eases off for half an hour; it was still raining when I took these, just not so hard. Beautiful - love all the tinges of orange and purple in these flowers and all that green. So many different shapes and colours. Very pretty!! Woad dyeing, that must have been an adventure! Beautiful photos, thanks for sharing. Woad dyeing sounds great - where did you do that? 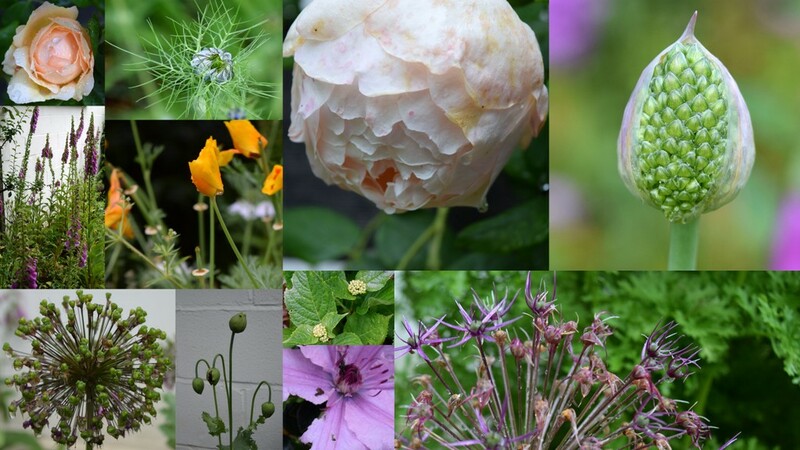 Love your flower heads - is that a chive flower top right?